Once upon a time ~ summer 2013 ~ Dee and her husband Pierre came into my life. It was a difficult time for me, a time of many changes. One change was needing a new home for little kitty Zoey and they welcomed her with love. As Zoey found her way and her place in her new home, she was also adopted by two brothers ... the handsome and gentle grey boy, TK ... and the energetic young one, Pip. The family lived in Maryland ... as I was moving from Florida to Maryland ... just as Zoey was making a new home with a new family, I, too was blessed to find new and treasured friends. As I write today, I am a guest in their Florida home and have been enjoying not only the company of these dear friends ... but the antics of Pip and Zoey. Though on arriving here about ten days ago, I could easily see what Dee had spoken of ... that dear TK's health had declined in recent months ... and he had slowed down so much. Nearly age 20 ... this dear boy was no longer robust, age and illness now taking it's toll. Sadness, tears, heartache ... filled the soul. On Monday, a visit to the veterinarian confirmed what was known in the mind. Dee made the decision to let to, to help TK cross his bridge. I am honored to have known, for brief times, this beautiful kitty boy! He was special. Rest well, TK. Forever. The tears keep flowing as I think of that wonderful soul and his dear, dear family. 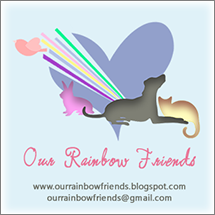 Love and hugs to Dee, Pierre, Zoey and Pip from all of us. Our hearts share the hurt. I'm so glad you were there for support too. So very sad when you have to let them go. They take a huge piece of your heart when they leave. Sending warm hugs and love to you all. Run Free sweet TK. 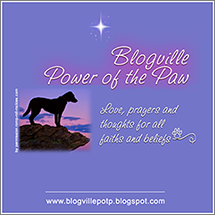 Purrs and prayers for TK's family and friends. Love to Dee and her family on the loss of TK. I remember him well from their blogging days along with his sister Squashies. My thoughts go to them, and to you also Ann who also got to know him well. We know how special TK and his family are to you. We are so very sorry to hear of his crossing, but TK had a long and good life. 20 years! That is just awesome. Soft woos and gentle hugs to his family and to you. I'm deeply sorry for TK's passing. Please extend my condolences to Dee and her family. I know there are no words of comfort at this time, but I wish her peace in her heart, in due course. Nicki and Derry send soft purrs. We're very sad that TK has gone OTB. We wish we had gotten a chance to meet him. We also are very sad about TK but he was well loved during his life with Dee and Pierre.He was such a lucky cat to had such a good home. We send big hugs to Dee. I know that you have become a huge part of Dee's family and that includes TK. I know as well that the loss of TK has also affected you as well. I'm so sorry. And please extend my heartfelt sympathy to Dee and her family. Run pain free across the Bridge, beautiful boy. Sending lotsa purrs and hugs. We're so sad that it was TK's time to go to the Bridge, but we are grateful that he was and always will be loved so much. 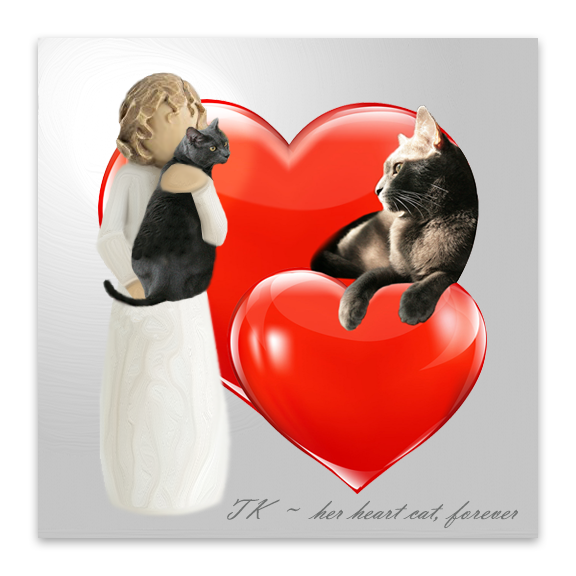 Sending purrs and love to you and TK's family.